One of the most important symptoms of pathological narcissism (the Narcissistic Personality Disorder) is grandiosity. Grandiose fantasies (megalomaniac delusions of grandeur) permeate every aspect of the narcissist's personality. They are the reason that the narcissist feels entitled to special treatment which is typically incommensurate with his real accomplishments. The Grandiosity Gap is the abyss between the narcissist's self-image (as reified by his False Self) and reality. When Narcissistic Supply is deficient, the narcissist de-compensates and acts out in a variety of ways. Narcissists often experience psychotic micro-episodes during therapy and when they suffer narcissistic injuries in a life crisis. But can the narcissist "go over the edge"? Do narcissists ever become psychotic? The narrowest definition of psychosis, according to the DSM-IV-TR, is "restricted to delusions or prominent hallucinations, with the hallucinations occurring in the absence of insight into their pathological nature". And what are delusions and hallucinations? A delusion is "a false belief based on incorrect inference about external reality that is firmly sustained despite what almost everyone else believes and despite what constitutes incontrovertible and obvious proof or evidence to the contrary". A hallucination is a "sensory perception that has the compelling sense of reality of a true perception but that occurs without external stimulation of the relevant sensory organ". Granted, the narcissist's hold on reality is tenuous (narcissists sometimes fail the reality test). Admittedly, narcissists often seem to believe in their own confabulations. They are unaware of the pathological nature and origin of their self-delusions and are, thus, technically delusional (though they rarely suffer from hallucinations, disorganised speech, or disorganised or catatonic behaviour). In the strictest sense of the word, narcissists appear to be psychotic. But, actually, they are not. There is a qualitative difference between benign (though well-entrenched) self-deception or even malignant con-artistry – and "losing it". The narcissists is usually fully aware of the difference between true and false, real and make-belief, the invented and the extant, right and wrong. The narcissist consciously chooses to adopt one version of the events, an aggrandising narrative, a fairy-tale existence, a "what-if" counterfactual life. He is emotionally invested in his personal myth. The narcissist feels better as fiction than as fact – but he never loses sight of the fact that it is all just fiction. Throughout, the narcissist is in full control of his faculties, cognisant of his choices, and goal-orientated. His behaviour is intentional and directional. He is a manipulator and his delusions are in the service of his stratagems. Hence his chameleon-like ability to change guises, his conduct, and his convictions on a dime. Narcissistic delusions rarely persist in the face of blanket opposition and reams of evidence to the contrary. The narcissist usually tries to convert his social milieu to his point of view. He attempts to condition his nearest and dearest to positively reinforce his delusional False Self. But, if he fails, he modifies his profile on the fly. He "plays it by ear". His False Self is extemporaneous – a perpetual work of art, permanently reconstructed in a reiterative process designed around intricate and complex feedback loops. 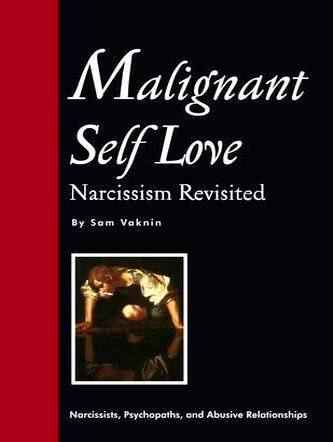 Though the narcissistic personality is rigid – its content is always in flux. Narcissists forever re-invent themselves, adapt their consumption of Narcissistic Supply to the "marketplace", attuned to the needs of their "suppliers". Like the performers that they are, they resonate with their "audience", giving it what it expects and wants. They are efficient instruments for the extraction and consumption of human reactions. As a result of this interminable process of fine tuning, narcissists have no loyalties, no values, no doctrines, no beliefs, no affiliations, and no convictions. Their only constraint is their addiction to human attention, positive or negative. Psychotics, by comparison, are fixated on a certain view of the world and of their place in it. They ignore any and all information that might challenge their delusions. Gradually, they retreat into the inner recesses of their tormented mind and become dysfunctional. Narcissists can't afford to shut out the world because they so heavily depend on it for the regulation of their labile sense of self-worth. Owing to this dependence, they are hypersensitive and hypervigilant, alert to every bit of new data. They are continuously busy rearranging their self-delusions to incorporate new information in an ego-syntonic manner. This is why the Narcissistic Personality Disorder is insufficient grounds for claiming a "diminished capacity" (insanity) defence. Narcissists are never divorced from reality – they crave it, and need it, and consume it in order to maintain the precarious balance of their disorganised, borderline-psychotic personality. All narcissists, even the freakiest ones, can tell right from wrong, act with intent, and are in full control of their faculties and actions.